I love serving food in miniature dishes--casseroles, ramekins, cake molds, etc.--so when I spotted these mini trifle bowls, I found myself creating ways to use them in my head. I think Jaime's recipe for Black Forest Cake Trifles (one of my all-time favorite kinds of cake) would be perfect for these adorable dishes. Or perhaps a something Autumnal featuring gingerbread cake and pumpkin mousse? Mmm...lots of options. What is your favorite trifle recipe for the holidays? I have mini trifle bowls almost exactly like this and I love them! I use them all the time...they're the perfect size. :) I've done trifle for showers, fruit salad, ice cream with toppings...etc! They're great. Mine are really durable, too. These are so cute. I love mini portions! My fave late summer trifle... gingerbread with lemon curd, blueberries and loads of whipped cream. My easiest trifle is layering broken up pumpkin pie with whipped cream and a lite sprinkling of crunchy gingersnap cookies mixed with mini chocolate chips. Yum-0. A great way to use up leftover pumpkin pie. 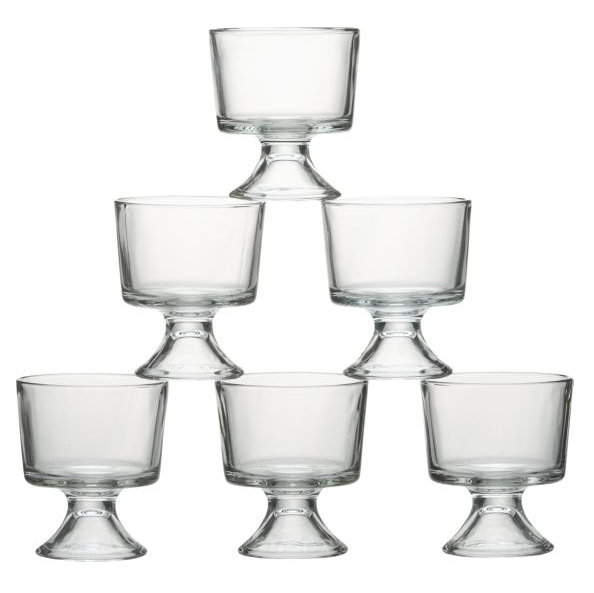 I gave these as a wedding gift to a dear friend and have wanted a set for myself ever since--precisely for individual trifles. And yes, I've made a gingerbread/pumpkin trifle before and it's delicious. I have some mini trifle bowls that I got at Walmart of all places! Everything looks cuter in them.